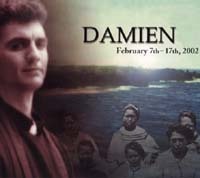 True story of a heroic missionary priest who risked his life to care for the outcast on the Hawaiian island of Moloka'i. Loving proof of the power of good over evil. The Order of Preachers, the Dominicans, was founded in the 13th century by St. Dominic in order to save souls through preaching and to rectify the corrosive effects of heresy on culture through dedication to the Truth. The Dominican charism esteems art as a formidable witness to the Incarnation and as an invaluable instrument of evangelization. Blackfriars Repertory Theatre carries on the illustrious theatrical heritage of the Dominican Friars in New York of the Province of St. Joseph. In 1940, Dominican Fathers Urban Nagle and Thomas Carey founded and conducted the Blackfriars Guild: a national association of Catholic theatre companies comprised of twenty-two chapters throughout the country. Moreover, Fathers Nagle and Carey together ran the only professional level theatre sponsored by a Catholic organization in the United States, and the first religious theatre ever tried in New York City. The Blackfriars Theatre, until recently popularly regarded as the American stages' oldest continuous Off-Broadway theatre, was Located at 320 West 57th Street. Blackfriars provided the proverbial great first break to several acclaimed theatre artists including playwright Robert Anderson, actors Geraldine Page, Eileen Heckart, Patricia Neal, Anthony Franciosa, Darren McGavin, and Shelley Berman, and producer Elizabeth McCann. Blackfriars Repertory Theatre preserves the philosophy and ideals of the original Blackfriars Guild dedicated to producing plays of artistic merit which reflect the spiritual nature of man and his destiny. This new initiative is comprised of a devoted company of priests and lay people. Blackfriars Repertory Theatre is committed to producing high quality theatre of all kinds that edifies, uplifts, entertains, and inspires. Blackfriars Repertory Theatre works in close collaboration with the Providence College Theatre Arts Department, with Compagnia Elsinor, an association of three theatres throughout Italy under the direction of Franco Palmieri and with St. Malachy's Church, The Actors Chapel, New York City.